Speedtractor teams up with friends, Animal Boat CC and Iceblock Films to find that there is indeed dirt in Tokyo…you just have to look for it. Japan is one of the places that I need to visit, there is so much I want to see there yet I haven’t had the chance. There are those who follow the rules to the T in Japan, and then there are those who live outside the rules and this case this is what Tokyo Dirt is, a look into the other side of motorcycling culture in Japan. There is a different feeling for those who love motorcycles, and crosses all the barriers of borders, race and language, it is its own culture. The cold is here and we have the streets to ourselves, well at least that is what I think when I wake up at 6 am after 4 hours of sleep. Honestly riding gets me so excited that I just want to get on my bike and rip the streets apart. Recently the streets have been somewhat empty and people don’t start riding except around 8 am for a good hour we have the streets to ourselves and we do ride like hooligans. We usually discuss the route before heading out, everyone is fueled up and we head our way. 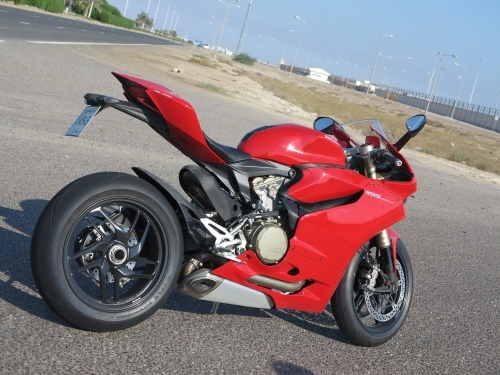 My rule is simple if someone is new to riding he become someone’s wingman and follows him at a steady pace, not a hard pace like the way some of us ride, if we are only experienced riders then it is every man for himself from point A to point B, and we honestly ride fast. 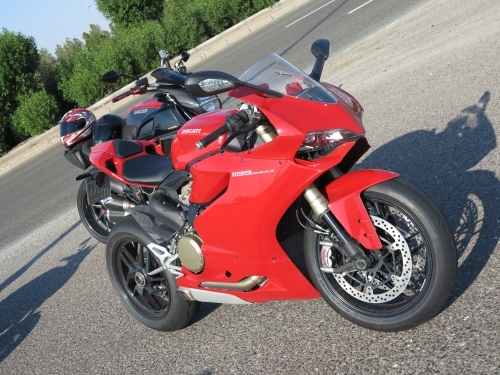 This time around we had the Ducati 1199 Panigale join us with an experienced rider. 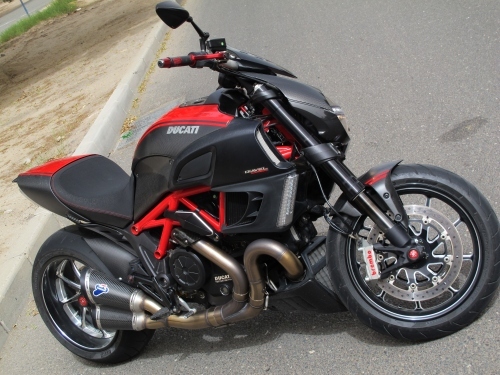 I have ridden with other machines and the Diavel can hold it’s own with 99% of the machines, hard accelerations and going into corners, but the Panigale is a machine of a different breed. He was pushing into corners where I felt that I was scratching the limit of my riding skills, it was still going, that machine is a beautifully fast and insane in corners. It was a hell of adventure and took a few different routes but I need to go and look for a few different routes to keep things interesting. I still think about Khasab Oman and Hatta UAE, those corners were beautiful. And the weather these days makes me want to ride, and even with the rain I want to ride, this cool weather just feels so good. Only serious speed junkies need apply. 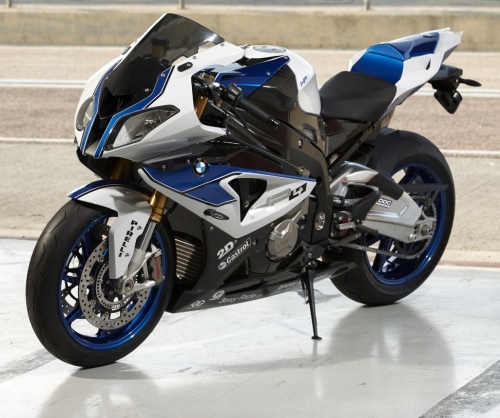 The BMW HP4 is a freak of nature, the S1000RR destroyed so many machines, people were not expecting such a beast, and now they topped it off with HP4. 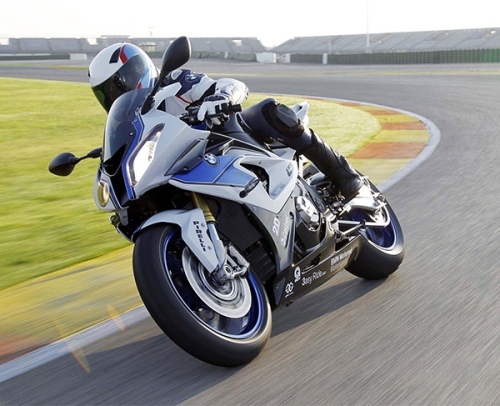 The lightest 4-cylinder supersports bike in the 1000cc class, the HP4 has 193 horsepower, and weighs under 440 pounds with its tank 90% full. I love the color scheme of this machine, I would love to add it to my collection, I’m already imagining the things I would do with this machine. BMW has gone all the way with so many options for this machine, and you can turn it into a racing beast or a weekend monster. When in search of R2D2 and C3PO these Storm Troopers know how to have their fun. Having fun on Tatoine while they there doesn’t make the Empire look too bad. I always thought the Storm Troopers looked cooler then the Republic fighters, anyone up to have some fun with the Dark Side? Full grown men riding customized trikes and drifting them around the road is something you would think a 6 year old would love, and I agree 100% . Watching this video Trike Drifting is insanely cool and looks ridiculously dangerous, there are some close moments but looking at them having fun makes me want to try it out. This video is from the guys who made the Largest Rope Swing, I hope they keep coming up with more cool stuff. A Sandstorm came in just as the weekend was about to start, and I was hoping it would clear up just before Friday morning. I woke up around 5:45 AM to see that it was still hanging in the air, I was hoping it would clear up and by 7 AM it cleared up a bit and I headed out. We were just a few riders heading out and the roads were empty, as if we have been invaded by Zombies, nobody was out on the street, it seems the dust kept people in. We were 3 vetren riders and one new guy to join the group so we were a bit slow in the beginning but we started pushing on the corners, but we tried to take it easy because of the dust, we didn’t want to slip while riding but still we were enjoying ourselves and the empty roads. I just detailed my bike the other day so all this dust was driving me nuts, but it wasn’t going to stop me riding. Its videos like these that make me want to ride my bike like Batman, it doesn’t help that the bike they chose is the BMW S1000RR which is one of the most powerful if not the most powerful machine out there, and the way the story is playing out it gives that rider a feel as if he is a super hero. All the footage was done with the new Nikon D800 which will be retailing for $3000. Canon snagged the DSLR/Video market with both the Canon 5D Mark II & the 7D, so lets see how well the Nikon D800 will measure up. 8 am Meet up and heading out right away, we wanted to make the best out of the time we had without any delays. But then we faced one major delay we weren’t expecting, our friend got caugt in a speed trap on 5th ring road at 7:48 am. That was the last thign I expected that early in the morning, we took some time but things worked out and the guy managed to get out of it without getting his bike towed which is a miracle. So we started off an hour later and took the roads as usual, and more people came out this weekend then the week before, seems a lot of people were back in town. We were riding hard and enjoying every corner, there were four of us, all Ducatis surprisingly, until about halfway through the GulfRoad an old friend joined us with a BMW 1000RR and he rode it like a mad man. 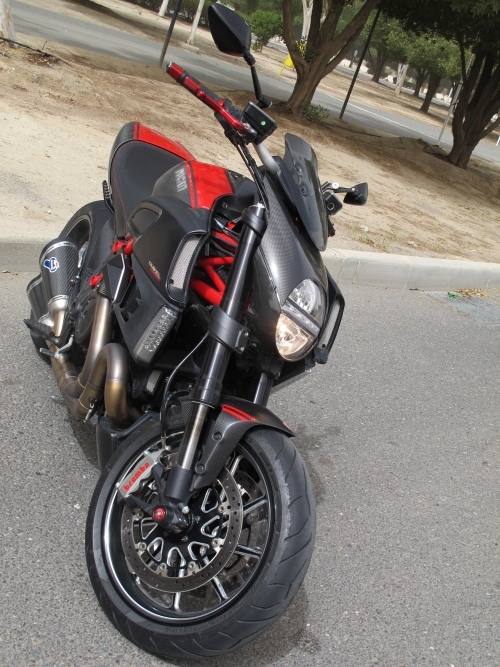 Then I noticed his bike, no light, number in the front, no plates, and running on slicks. He was riding a full on race bike and we was making us look like old ladies. When we stopped and I talked to him it seems he has been racing professionaly on his own in the SBK Championsihp (Superbike) and now he is ranked 12th in the Gulf. He has been taking his bike from Bahrain to Qatar and to other locations to practice and race on the back of his Chevy pick up truck. Now that takes a lot of dedication, and the last time I rode with the guy was about 2 years ago and he is insanely better then what he used to be. 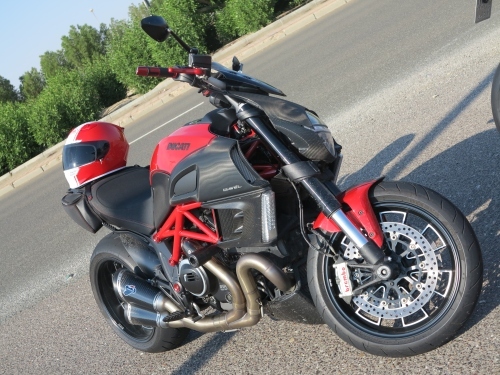 It was a hell of ride and we took another which had a lot of fun turns heading to Doha which was entertaining and still I want to find new roads. This was probably one of most unorganized rides I have ever had and we kept adding more and more people throughout the ride. 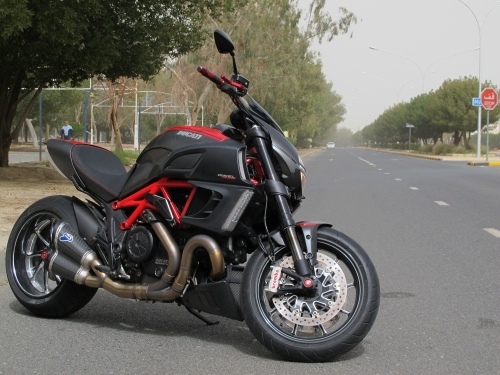 Towards the end of our ride we were Eight Bikes and One Ariel Atom so it was quiet a high speed tour of Kuwait. We had our mix of machines and mix of riders, from the extremely well experienced to the novice so it was a learning curve for a few people. The weather couldn’t have been any better, sunny and slightly cold, the perfect weather to go riding. We had a route in mind but we didn’t a chance since one of the guys ran of out gas but we still had a fun time. One of our friends had a close call from a woman who cut across three lanes and almost took him out in a round about but he managed to avoid being taken out even though he still get hit. The crazy thing is that she didn’t even bother to stop on check on him, I stopped to check on him and had the urge to chase after her. The whole road was empty and she had all the road only to almost take him out. Luckily that didn’t kill our mood after we made sure everything was ok.
We are planning to be slightly more organized next week for a better ride and a lot longer. Keeping this many people on schedule is difficult as hell but when you get everyone on time its a ton of fun.